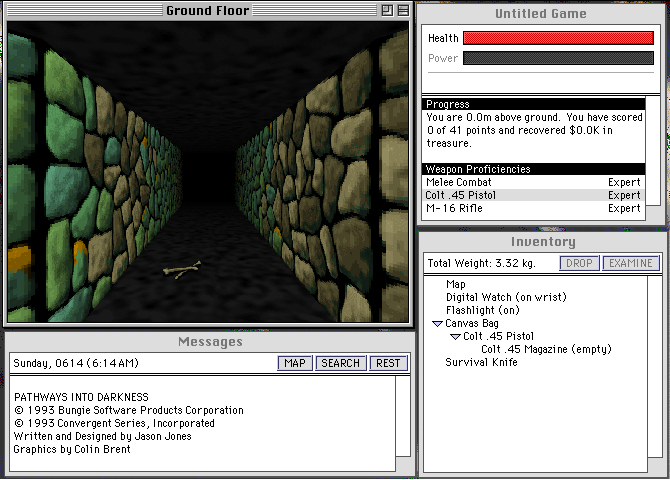 Bungie’s first ever game1 was the first person-adventure hybrid Pathways into Darkness. This is an odd game that looks like it’d be kind of painful to play through today, which is why it’s a good thing that somebody has already gone to the trouble. Even this first effort – flawed though it was and which existed as a kind of prototype for a small company that was just stretching its legs – showcased Bungie’s greatest strength: their ability to turn something that might otherwise be unremarkable by the standards of the time into a compelling experience through the addition of a well-written and well-told story. Pathways is all about a special forces team dropped into an alien pyramid in the South American jungle. Their mission is to descend all the way to the bottom of the warren of tunnels that lies beneath it and detonate a nuclear weapon in order to stop the awakening of a Cthulu-esque dead god. This is a very good premise even if you don’t like Lovecraft because it allowed Bungie to do some rather interesting things with the adventure game format; for example, on your trek through the tunnel system you find the butchered remains of other pyramid explorers who can nonetheless be talked to post-mortem using an alien crystal. Piecing together what happened to the previous expeditions and avoiding the traps and monsters that killed them forms the bulk of the game’s storytelling, and it’s an effective way of creating an oppressive, bleak atmosphere – even leaving aside the inherent nihilism of talking to the dead years after they have perished, the player is constantly confronted with evidence that the pyramid is dangerous and will kill them if they’re not careful. 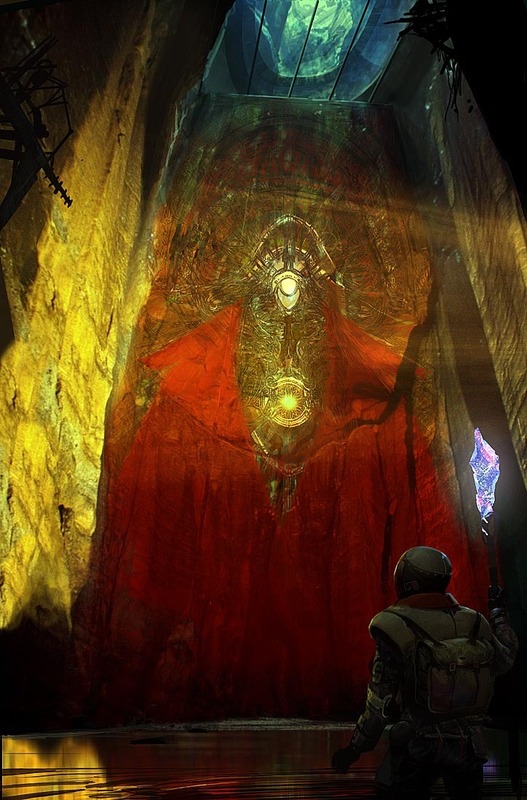 Pathways was a moderate success that gave Bungie the funding they needed to start work on a second game. This began as a sequel to Pathways but, after the spectacular success of Doom (released just after Pathways), it switched track and became a true first person shooter: Marathon. Contrary to appearances — and at first glance they look very, very similar, with space marines toting futuristic weapons attempting to avert an invasion from an outside source — Marathon was not one of the legions of Doom clones attempting to cash in on the sudden FPS frenzy. Marathon made an attempt to take the genre in a new direction. 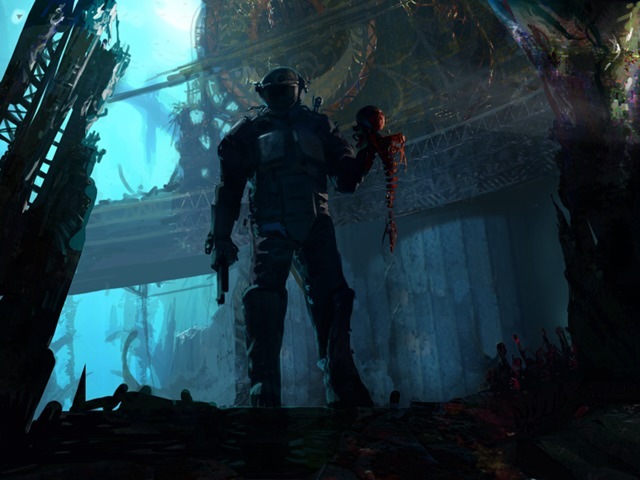 Where Doom simply said to the player “Here is a gun, now fight your way through the infernal legions into the very maw of Hell,” Marathon tells a full-blown and intricately detailed story – a story that was so good they went back and shamelessly plundered elements of it to use in the Halo franchise. The titular Marathon is a vast colony ship (built by hollowing out the asteroid Phobos and hurling it at the stars) which has recently arrived at its destination, the star Tau Ceti. The player is a security officer out on a routine shuttle mission when suddenly all hell breaks loose: an alien ship warps in and boards the Marathon, attempting to take it and the newly-built colony by force. To make matters worse one of the three AIs running the Marathon, Durandal, is in the advanced stages of rampancy (a neat Bungie concept where an AI becomes exponentially more intelligent as it ages, but also increasingly unstable in terms of sanity) and appears to be masterminding his own agenda. The player has to follow instructions from Leela, the sole surviving AI still on their side, in order to take back the Marathon and free the colonists. Marathon’s gameplay is almost pure Doom; it includes a few new features like the addition of NPCs that are on the player’s side (the other colonists) but otherwise it’s functionally identical — this is no bad thing, mind, because the gunplay and the level design is on par with that of Doom, which was excellent. With the bleak post-apocalyptic FPS wasteland created by scripted cutscenes being some years distant, Marathon opts to tell its story via a series of in-game terminals that can be accessed by the player. These are the medium by which the various AIs in the game communicate with you: Leela, attempting to coordinate a desperate defence of the Marathon; Durandal, alternating between taunting the player and offering dubious “help”; and finally Tycho, the third AI which has been subverted by the aliens. The plotting, scheming and mutual recrimination amongst the AIs takes up most of the terminal time, but Bungie also put in various bits of backstory that hint at why the aliens are there, why Durandal became Rampant, and why the player is capable of murdering legions upon legions of cybernetic monstrosities with barely a scratch. They even find the time to paint a picture of the situation back on Earth and the reasons for launching the Marathon in the first place. Not bad for a game that uses the mechanical equivalent of e-mail2 to tell its story. 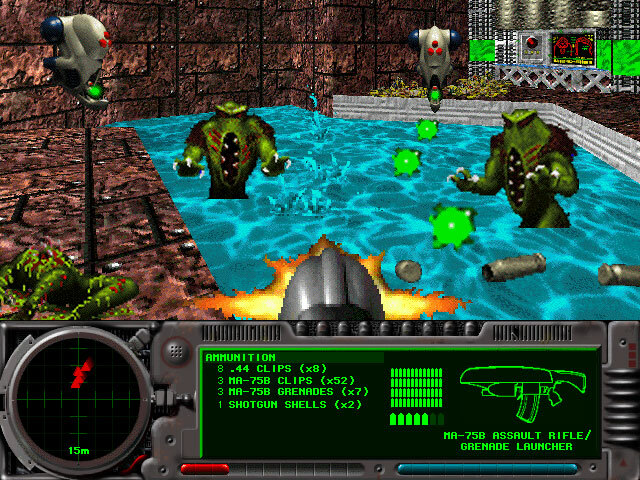 Marathon was a big hit with the Mac-owning community – the staff of Amiga Power were particularly taken with it – and Bungie duly started work on a sequel, which was released on Mac on 1995 and PC in 1996. This was Marathon 2: Durandal, a game which focused solely on the sociopathic, manipulative Rampant AI from the first title. Durandal is helping one of the alien slave races rebel against their former masters for reasons unknown, and to do this he’s kidnapped the player at the moment of victory in the first game. After spending seventeen years in cold stasis the player is rudely awakened, handed a gun and set loose on the alien slaves’ occupied homeworld to decimate the garrison there. The aliens themselves are massively, massively pissed that that their original force was defeated so completely, and not only do they wipe out the survivors of the Tau Ceti colony but they also send a full battle group of ships after Durandal’s captured alien scout vessel accompanied by an angry and vengeful Tycho, still smarting over what was done to him in the original game. As the story unfolds the player character is caught between the two warring AIs as he desperately attempts to unravel the mystery of the ruined homeworld. 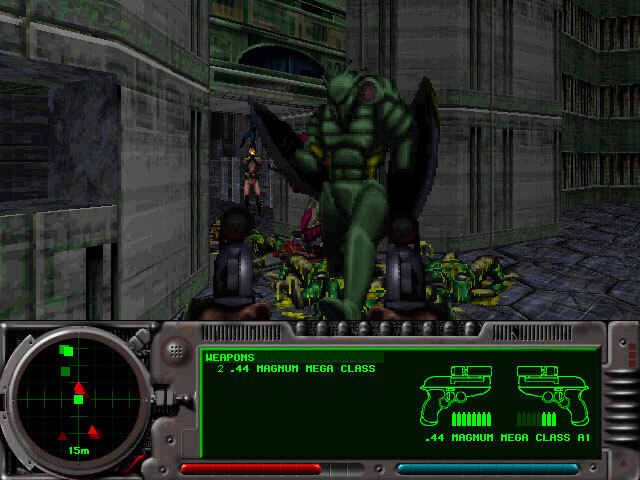 Durandal did everything that Marathon did, only better – it had more levels, more enemies, better audio, new environment features such as water, and if you ask me it really nailed the feeling of being an explorer on a dead alien world. The story is absolutely cracking too; the capricious character of Durandal never wears out its welcome and there are some amazing moments as the vendetta between him and Tycho progresses to its natural conclusion (WARNING SPOILERS). If the player has been paying attention all the way through Marathon and Durandal the last line of the final screen hits like a punch in the gut. Unfortunately the PC release was largely ignored thanks to the release of Quake three months earlier; nobody was interested in 2.5D shooters after that, and after the release of the third game in the series – Marathon: Infinity3 – the series faded into relative obscurity. However, Bungie still had one card left to play. Noting that the PC release of Durandal had been something of a flop and concluding that they probably weren’t going to sell many more copies, they released the source code for it in 1999. This allowed the reverse-engineering of the free Aleph One open source engine to which all three games were eventually ported. That along with the staggeringly in-depth (and now rather venerable) Marathon Story page ensured that the series retained an ever-growing cult following, which eventually led to the release of the second game on Xbox Live Arcade in 2007. It’s nice to see Marathon finally getting some of the recognition it deserves, although it’s also somewhat bittersweet to think that the Halo series is as close as we’ll ever get to a modern successor. So, go and download the freeware versions (which finally hit version 1.0 last December after a decade of development work). Give them a whirl. 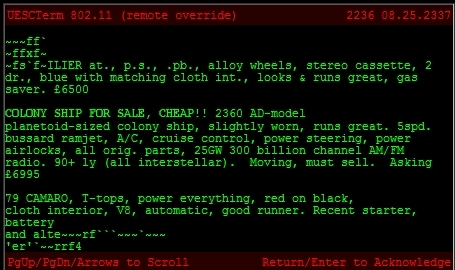 If you don’t feel like playing through the games themselves you can still read through the terminal screens that tell the story – and it’s definitely a story worth reading. It’s not often a series like Marathon is lovingly preserved in the way it has been, and it’s only possible because of a rare collusion between developers (who released all three games for free in 2005) and dedicated fans (who came up with the Aleph One engine that allows the game to be run on modern versions of Windows). Next week: Bungie turns their attention to the strategy genre and makes one of the best fantasy RTS games ever. 1. That is, developed and published as a full company. Their real first game was an adventure game involving the Cretan labyrinth and the minotaur that was developed by one of the founders while he was still at university. 2. Interspersed with gorgeous digital art heading up the chapter screens, several of which can be found adorning this post. 3. This was something of a misstep for the series if you cared about the single player, as Infinity was a title that largely focused on the popular multiplayer aspect of the game. The single player campaign was subcontracted to a different development house, and it shows. It would not particularly surprise me if you and I (and Janek) were the only ones who had played it. I didn’t actually find out about Marathon 2 until some time later and I wasn’t able to imbibe all of the rich story in its totality and entirety. Haven’t actually ever played it, although I’m chuffed that you’ve included me in the club of “folks who would have.” Though I suspect my membership badge will soon be taken away. Oh come on, Halo is not THAT bad, I mean, it is a bit milked but the story is fairly deep. Hey I *liked* Halo. I think it’s a great game, and it really nailed the whole atmosphere of the desperate fight against superior alien enemies thing for five levels or so. And then the Flood happened. Halo 2 was all-round garbage, Halo 3 was a competent game with a garbage plot, and then my 360 fried itself rendering me unable to play any further Halo games. Which is a shame, because I understand ODST was quite good.